I wish all the readers of this blog a happy new year! May you be successful and have fun in 2019! Also, as the tradition demands, I give away my software for a big discount, for a short amount of time: The ambiera new year sale is running again, currently. There is for example RocketCake 2 for -50% and CopperCube 6 for -30%, so there is something in for you too, maybe. 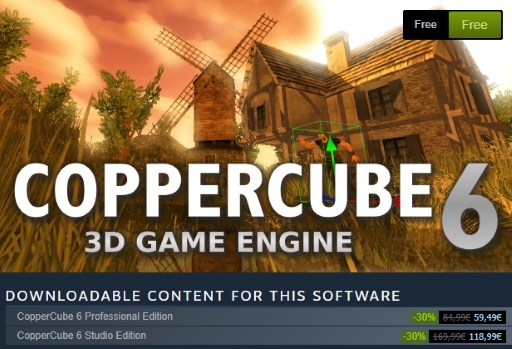 It is still basically free, but if you want to support CopperCube, you can buy the Pro or Studio edition (a DLC on Steam), now with a -30% discount for a few days. If you already own CopperCube 5 Pro, there is also a Steam bundle which makes it even a bit more cheaper for you. There is a car moving in there. I originally wasn't sure if the game would have animated cars, but I decided that it would be much nicer with them. The Minibus you can spot in that gif is the first attempt at making this work, too. I'll likely write more about that next time. I had to push this out because some people sometimes had problems with the editor UI not working at all: Sometimes, ComboBoxes and sliders simply wouldn't work at all. 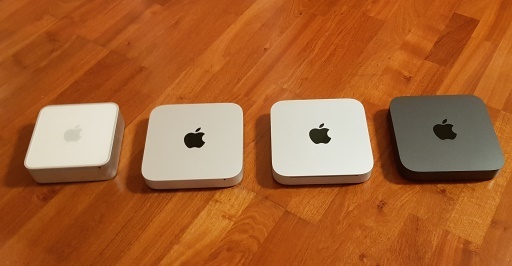 I bought a new Mac Mini among other things too be able to reproduce and fix this problem, and after many tries, somehow, finally RocketCake behaved exactly the same as reported by some people. 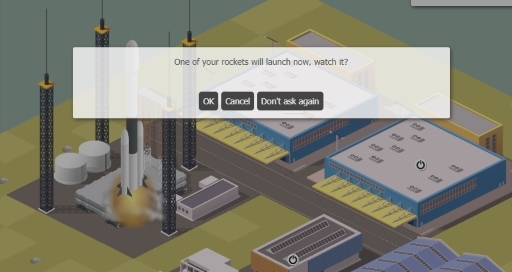 Still not exactly sure if this was the reason, but I was able to fix this behavior by rebuilding a few underlying libraries, linking with a newer MacSDK, and making RocketCake stricktly 64 bit only for macOS. It's a bit scary, though. Especially since this only happened on Mojave and the app works perfectly on all previous 6 versions. Hope Apple will test their OS a bit more before shipping it in the future. Also, if you want to help, you can upvote the tags of the game on the steam page. Some friendly people let me know that the planned name for my next game, which was "Business Builder" probably wasn't a very good choice: There is a mobile game which has a similar name, although not the same one. That's also why I overlooked this. Still, unfortunate. I could go on using "Business Builder", since it is not the same, but to avoid confusion and because the game is still in development, a change of name is a good idea. So I changed the name, and "Business Builder" will now be named "Business Magnate". Website and logos are already converted, and I think although that new name is a bit more complicated, it better tells you what the game will be exactly about. Starting it up, it is surprisingly fast (especially compared to the older versions), only that default "natural" mouse wheel scrolling (which is inverted) was annoying. It only has two 'normal' USB ports, the remaining other 4 ports are USB-C, so I guess I need to invest in a few adapters. Another change: The power adapter is now internal, as it seems. It only has a simple cable connecting to the mac. All my older macs have external ones. 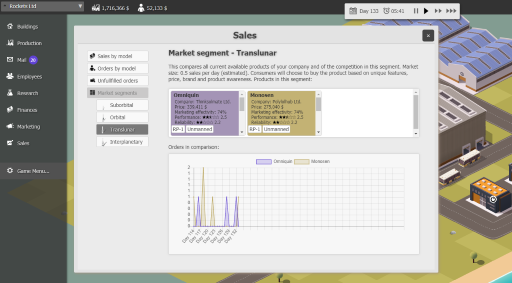 I am developing a game named Business Magnate. 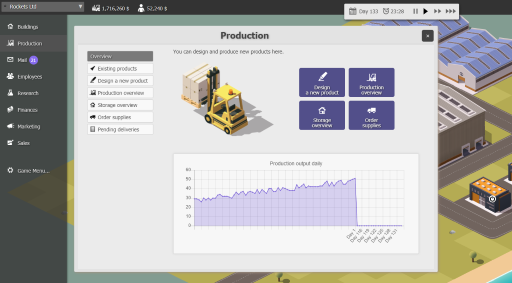 This post is part 2 of its development blog (part 1 is here). What it does is basically speeding up the hit-testing: Every frame, I need to lookup which building is under the mouse cursor, and do a image lookup to do pixel perfect hit-testing. For big images, and a lot of them, this could mean that a lot of data needs to be kept in memory for this, increasing cache misses, or even worse: transferred between GPU and main memory. To prevent this, a size reduced and only 1-bit-per-pixel version of the image is created and held in memory, to do very fast hit-testing. If for example we have 10 building types with a size of 512x512 pixels, we would need about 10 MB for this, which would have needed to be transferred and unlocked. The hit-testing images only need 0.3 MB instead, which is a very nice improvement for this. The fact that the image isn't exactly matching at the borders is negligible, the error is too insignificant for users to notice. I tried it out, and it feels very nice. Also, the game runs quite fast that way on slower systems. A simple algorithm quickly scans for neighbouring tiles after the user placed a new street tile, and adjusts the tiles to connect in order to form streets. No magic there. 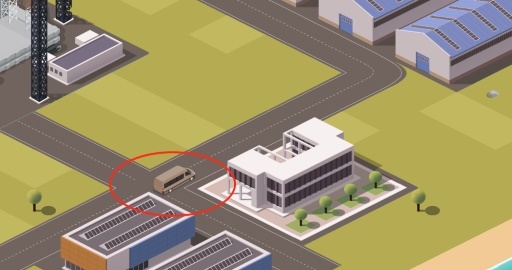 I'm not yet sure if it will be necessary in the game to have an efficiently planned street layout, but the company and building setup you can create in the game will definately look a lot nicer with proper streets. When I started developing the Irrlicht 3D engine nearly 20 years ago, I always had a public roadmap on the website. Not sure why I didn't make one for the CopperCube 3D game engine as well. So time to change that. The official CopperCube roadmap is now available, too. It's still a bit empty, but I guess it will fill more and more during the next months. It only contains the big items (not bug fixes and similar), but if I forgot something very important, please let me know! This is the development blog of the Irrlicht Engine, RocketCake, CopperCube, and similar software projects, and the personal blog of Nikolaus Gebhardt. 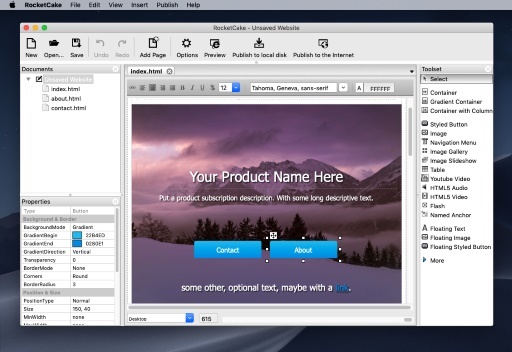 I am the author of these projects and working as programmer in Vienna/Austria (Impressum). On Twitter, I'm @ambiera. Pivot Template based on a template by Marco van Hylckama Vlieg, modified by Nikolaus Gebhardt. Get Data Protection, Privacy and Imprint info here.